Later in this magazine there's a story about the apocalypse and a long-tail bicycle ridden by a man named B.D. Barton. He's rough-edged and something of a survivalist, but not in what you'd call an organized way. He doesn't stockpile cans of carefully-preserved food. He doesn't make lists of first-aid supplies and he certainly hasn't ever contemplated keeping a packed suitcase on hand for emergencies; hell, even before the apocalypse B.D. rarely changed clothes or slept without his boots on. B.D. is, I guess, what you'd call a lazy survivalist. If there's one thing that a lazy survivalist admires above all others, it's a piece of gear that will do its job with very little, preferably no, maintenance. Gear that will take a beating and not say much about it. Gear that never asks, "What have you done to make me happy?" Gear that, if it were a person, would never seek therapy, never whine, and would be capable of healing easily. It's this last requirement that makes a distinction between the lazy survivalist and the merely lazy. You see, the lazy survivalist is smart enough to know that everything breaks eventually and they have no qualms about effecting a repair. That's the survivalist talking. But when lazy talks, it insists that it will not carry around a menagerie of specialized parts and tools. The lazy likes to sermonize on the virtues of objects fixable with hammers, vice-grips, and duct-tape. The lazy is also a realist and knows that even if it were to maintain a heap of repair parts, something like the apocalypse would come along and said parts would be stolen by starving marauders or they'd be left behind the first time B.D. gets attacked by zombies and hast to flee without his backpack. So for these reasons, B.D. equipped his Big Dummy with shifters that meet every requirement the lazy survivalist could throw at them. B.D. wanted shifting that wouldn't insist he fuss with that complex-looking thing by the rear wheel with the French name. He wanted shifting that he could jury-rig in the field if he broke a shifter in a crash. He wanted shifting that felt solid in his hand and that could be adjusted on-the-fly if things got bent by a stick or fouled by mud. So what is this magically-stoic shifting system that helped B.D. stay mobile after the apocalypse? Paul Thumbies. What the Heck's a Thumby? 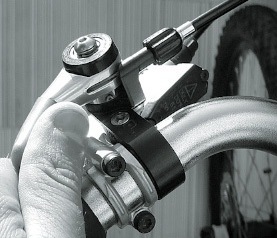 Paul Thumbies are billet-aluminum handlebar mounts for Shimano bar-end shifters. They position the bar-end right where your thumb is, turning it into a thumb shifter that is both accurate and easy to shift. Because they us Shimano bar-ends, they give you not only clicky indexed shifting, but they also let you switch to pure friction mode if something gets out of whack (or you're going for a group ride with a bunch of Rivendell owners). Very well. They are hands-down my favorite shifters of all time. There's a reason I make my fictional post-apocolypse characters use them. Because they're awesome. As mentioned above, they let you use indexed shifting when things are well-adjusted (and it's a very solid-feeling index at that) but when stuff gets damaged, worn, or just plain wonky, you can switch to friction mode and hand-tune each gear to work with whatever misbegotten setup you happen to be running at the time. Naturally, they don't work very well with a drop bar. But match them up with a Mary bar (pictured) or some big xtracycle-style swoopers, and you've got commuter-shifting gold. I've been running them both on our Big Dummy and on my 29er mountain bike and even on the trails where shifting is critical, I find I can shift faster and more precisely with the Thumbies than with a trigger shifter setup. I like being able to tell by feel what gear I'm in and I like being able to slam through five gears with a single swoop of the shift lever. To be honest, I don't know anything about Paul, but I do know that his Thumbies are well-made items. The machining is top-notch and the details have been well-attended. You do have to provide the barend shifters, so the whole setup will cost you as much as trigger shifters, but the solid feel and appeal to the lazy survivalist in us all, makes them well worth it.